Fender Newport review | What Hi-Fi? The likelihood of any of us getting on a stage in front of millions and bashing out a few power chords becomes slimmer by the day. 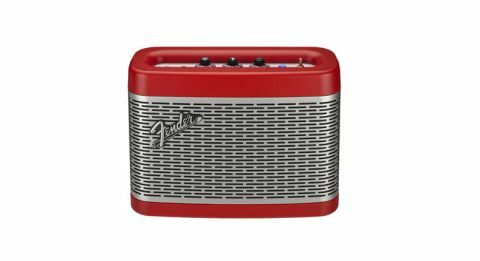 But even if that rock star lifestyle is getting more distant, you can still get a small slice of it with Fender’s Newport speaker. Fender’s brand name is better associated with its guitars, but it has recently been taking steps into the world of consumer electronics with its own range of headphones and wireless speakers. A big part of the appeal of Fender’s speakers is their design. Much like its bigger sibling, the Monterey, the Newport looks like a miniature guitar amplifier – complete with witch-hat knobs on the top. On the inside are two woofers and one tweeter, powered by 30W of amplification. The size and weight of a bag of flour, it feels remarkably well made. It’s heavier than you might expect, but that only emphasises its sturdiness. The Newport is available in three colours, ‘Dakota Red’, ‘Sonic Blue’, black or silver. Around the back you’ll find a power input, a 5V USB (type A) port for charging your smartphone or tablet, and a 3.5mm auxillary input. The three rotary controls for volume, bass, and treble turn smoothly and are fun to play with. There’s also a button for pairing the speaker wirelessly and a ‘talk’ button for taking phone calls. A small 'on-of'f toggle switch brings the speaker to life. Flicking it on illuminates the blue amp jewel while the Newport lets out a warm guitar strum. It’s these small details that make this speaker so enjoyable to use. We’d like some way to control playback directly from the speaker, but that’s really the only major omission we can think of. Hit the ‘Pair’ button and the speaker releases a different guitar strum to indicate it’s available to pair up with any devices within a 10m radius. You can also take it out and about. The lithium-ion battery has enough power to run for a claimed 12 hours, or to charge the average smartphone twice. And not content with the regular, run-of-the-mill Bluetooth connection, the Newport offers aptX Bluetooth which allows you to stream at a ‘CD-like’ 16bit/44.1kHz, which is an appreciated addition and one we’d like to see in more small speakers. Unfortunately, getting this speaker to sound its best isn’t a case of just cranking up all the dials to ten and kicking back. We’d recommend choosing a song you know well and turning the bass knob from the bottom to the top a few times until you find the spot you like and – then do the same with the treble dial. Fender doesn't suggest any 'sweet spot' so you have free rein. In our testing, we prefer around the mid-way point – five or six – but that may well differ depending on your room size and shape, and the surface you’re keeping the speaker on. It’s also worth letting the speaker run in over a couple of days, too. But once all that’s done, your reward is a well-balanced sound. Solange’s Don't Touch My Hair is kept in line by the Newport, with the bass beats put in their place to make room for Knowles’ clear and delicate lyrics. Those lower frequencies have a solid punch to them too - impressively so for something so relatively small in stature. The two woofers perform well, able to differentiate between the thumping strikes which keep time through the track and the way the bass changes to a lower gear for the deeper beats. Moving up the frequency range, Knowles’ voice is respectably refined. It’s clear she’s being judicial with her lyrics, setting boundaries between each note to reflect the message of the track. The Newport reveals the small breaths, the melisma to her tone, and the texture of Sampha’s husky whispers when he comes into the song. Some rival speakers have the edge when it comes to detail, but you won’t be left disappointed. It wouldn’t be a proper test of a Fender product without some classic rock ‘n’ roll, so we blast out Jimi Hendrix’ Voodoo Child (Slight Return). The choppy guitar at the start of the track rises from the depths well and, once the first few licks have been played and the full force of Hendrix’s riffing begins, the Newport’s sense of dynamism is revealed. Strong and forceful for a speaker in this price range, it’s a game performer that handles the change from loud squealing notes to quieter, rumbling riffs to satisfaction. It’s timing is tight too - though your foot starts tapping a little more readily when listening to the £150 Ultimate Ears Blast, the Newport keeps good pace. One area where it does lose its cool, however, is with outright volume. Winding up the dial, we find noticeable of distortion on tracks such as Leonard Cohen’s You Want It Darker. Driven this hard, a sharp, crackling quality sits on the edges of Cohen’s vocals and it's not pleasant to listen to. It’s a marked change from the speaker’s otherwise smooth approach, and does mean you won’t be able to push the Newport as loud as it you might ideally like. But that’s not a complete deal-breaker, especially if you’re predominantly using this speaker in a home environment where you won’t want it on full blast. This speaker carves its niche as a charming hi-fi miniature that’s easy to use and sounds pretty good too.